The World Community Film Festival has been bringing films from around the globe to Courtenay for the past 18 years. February 5 and 6, click 2010 sees the 19th annual festival launch yet another exciting weekend of documentary films showing in five venues in Downtown Courtenay. It’s issues like this that many Valley residents and people from as far as Victoria come to find out about. They want to be informed and independent movie making is an excellent source for information. People also want to know about solutions to many problems we experience in our own towns. The festival is a showcase of stories of everyday heroes who have stepped forward to take action, responding to the challenges they see in their world. Those solutions can come from as far afield as Bogata, Columbia. The Film Festival is a vital conduit for information from unusual and alternative sources. Solutions to common problems are being found around the planet and their films share the information and knowledge with us. Choosing the films is a long process that begins months before opening night. Films make the rounds of the four committee members—Bradley, Janet Fairbanks, Heather Wilkinson and Gordon Darby. Each participant rates their opinion on the cover before sending it on. All the films are chosen by concensus. This is a time-consuming labour of love with the potential to be overwhelming—there are films on many topics most of us don’t want to know about. The committee has to do a fine juggling act between information that is helpful or that they think ought to be more widely known, yet not have the viewers leave with a feeling of helplessness and that the world is a vile place. “The aims are to unite people and let us see we are facing the same problems, and that there is power in protest, raising one’s voice, getting involved politically, whether it’s writing letters or running for office. Another film entitled Garbage Dreams, was filmed over four years and has won multiple international awards, including being short listed for an Academy Award. Garbage Dreams follows three teenage boys born into the trash trade in the world’s largest garbage village, a ghetto on the outskirts of Cairo and the decisions they are forced to make when globalization threatens their livelihood. The Comox Valley masters ringette team takes a break before a recent practice. cutting around the defender, and shoots, aiming for the top left corner of the net. The goalie slides across the crease and pops up her hand, but she can’t catch the ring before it catches the net. The players on this inaugural masters’ team come from all athletic backgrounds and they are here to be a part of one of Canada’s heritage sports: ringette.Ringette is a Canadian game that was first introduced in 1963 in North Bay, Ontario by Mr. Sam Jacks. 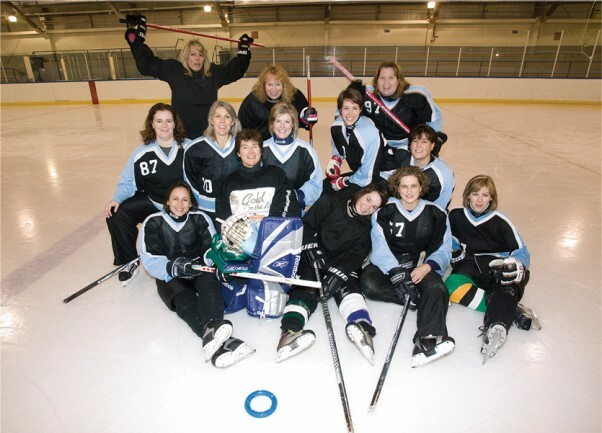 Originally developed for girls as an alternative to hockey, ringette is a fast-paced team sport on ice in which players use a straight stick to pass, carry, and shoot a rubber ring to score goals. The rules vary slightly from hockey and some of the key differences are that players must pass over the blue lines, body checking is not allowed, and there are only three players from each team allowed in the offensive and defensive zones. Harding’s ringette “resume” includes officiating, evaluating and instructing qualifications. Three years ago, Humphrey contacted him about possibly coaching and officiating in the annual Masters’ Tournament hosted by the Nanaimo Association (the only registered association on the Island at that time). He was impressed with the number of other master ringette players who were regularly commuting to Parksville and Nanaimo to practice and play on what was then, the only Island team. Berger’s daughter, Michelle, started playing ringette six years ago in Thunder Bay. She hadn’t skated before, but was intrigued when she saw the game being played at a local arena. She flashes a huge smile and admits that “I didn’t know what the sport was. I couldn’t skate or anything, but it was so much fun! My mom signed me up and my coach taught me how to skate, how to play, what the rules were.” After moving to the Valley, her first opportunity to play was with the regional team put together for the BC Winter Games in 2008. Humphrey’s daughter, Kyra also had to wait to play again until two years ago when Humphrey decided to put together a team for the BC Winter Games. Humphrey recalls that winter as the “winter of driving” for her practices and her daughter’s in Nanaimo. “That was a crazy winter but we got the team together and went to the Winter Games. Our goal was to score at least one goal but we didn’t do that. The hardest part to prepare for was just to have the kids mentally ready to be beat like that. Most of the teams at the Winter Games had been playing together for 10 years. Our girls had only been playing together for four months! This spring, Humphrey would like to do a youth and an adult floor ringette league. The interview is winding down and Humphrey is starting to put her gear on for practice. The gear is mostly hockey equipment, although there are lighter alternatives available, specifically for ringette players, and the sticks and face masks have to be approved ringette pieces. The youth league is open to 7 to 12 year olds and practices on Tuesdays from 3:30-4:30pm at the Comox Valley Sports Centre, Arena #1. The Masters team is for players 30 and older and practices are Mondays from 10-11pm at the Glacier Gardens Arena. Both divisions have ongoing registration and are open to girls and boys.